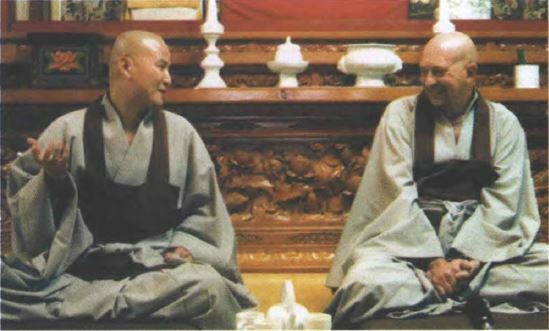 On my first holiday from Mongolia in two years, within an hour of arriving at Hwa Gye Sa Monastery, I found myself dressed in the gray robes of a Korean monk and meditating with a dozen Western monks and nuns belonging to the Seoul International Zen Centre. The daily schedule ran from 3:00 a.m. – 9:00 p.m. with sessions of prostrations, chanting, and meditation. Until then, my hips had given up the idea of long periods of meditation, but there was no choice, and, in another lesson of mind over matter, gave no trouble. I have to admit that to remain awake during the one-week retreat I resorted to matter over mind in the form of progressively stronger doses of caffeine. For the last five days, the Zen master, Do Kwan Sunim, extended the evening meditation until midnight, reasoning that the difference between sleep and death is that when we are dead there is no way we can ever get our legs to walk again. “Katz!” he screamed at me.